You’ve heard of PRObiotics – the beneficial bacterial population in our bodies, but what about PREbiotics? Prebiotics are found in certain foods and are essential for increasing and feeding our healthy beneficial gut flora which go to make up our microbiome – that nine-tenths of who we are – but we simply do not get enough. You have trillions of bugs living in and on you, without which you would not survive so looking after them is important. 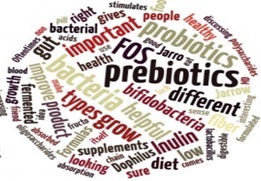 A prebiotic fibre like MaxiFOS is the food of the microbiome, as it’s indigestible to us – it’s their food, not ours. We take a prebiotic fibre (tastes delicious by the way), and it is then food for the healthy bacteria, which keep us healthy. Natural sources of prebiotics include the Jerusalem artichoke, garlic, onions, green bananas, fresh herbs, asparagus and dandelion root. But as mentioned, it’s hard to get enough of this precious indigestible fibre – so taking it with your probiotics is always a great idea. Have a teaspoon to a tablespoon a day for good health. Start on one teaspoon a day, directly into your mouth, in water, coffee or any food or drink. It’s got a lovely sweet taste but is not sugar nor is it treated as such by the body – it’s indigestible remember and is going to be eaten by your healthy flora. Try my top quality A-grade MaxiFOS powder – just a spoon a day. Not only is it delicious, it’s very affordable, and as you can see – does so much for your body including gut, heart and metabolic health. Find it in my online store here.